Ive got a computer with windows 2000 running an old version of n-track. I recently got an e-mu 1212 soundcard and its sending the sound out fine (to two of my mixers imputs) but I cant record. I'm sending the control room out of the mixer. I tried the main out. Still no recording. N-track isnt registering anything on the VU's. Whats going on? I want to re-case a boss pedal. i realized after taking it out of the case and hooking it up, it didnt work. im assuming this is because it was no longer grounded? im planning on putting it, essentially, in a wooden box with a metal face. how would you recommend doing this so that the thing would actually work when the project was completed? links etc would be amazing! Sometime later this month, I'm finally going to get around to building a [nice, not half-assed crappy-looking one] pedalboard, and am getting kind of ambitious. The question is: does anyone know what a true-bypass circuit looks like (as in, how would i create one)? Basically, along the bottom of the pedalboard, i want to have a metal panel with a series of switches and LEDs. Instead of plugging the pedals into each other, each one is plugged into a corresponding switch (the switches are in series, so you can still change the sound by moving around the pedals). Every switch will have a status LED and be wired with a true-bypass circuit. One other question: should I cover it in tweed or denim? Just for votes and fun's sake, of course. Hello, I am looking for cheap pedals to just play around with and learn about. Any idea where I can find these things? Are they hard to find? 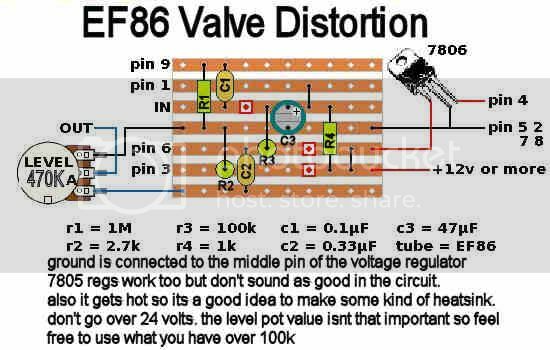 I was wondering if you could build a bank of passive filters, essentially just jacks with a resistor in between them. just have a different size for each one. would this be practical to run audio through? im not interested in quality of sound, just manipulation of sound. Ive got a Leslie combo pre-amp pedal model #020875. I do not own a leslie cabinet, nor do I own a organ that can accomodate one. Would it be possible to convert this into a stand-alone preamp, to use for guitars or microphones and such? anyone have any information (schematics, etc.) on building a small tube bass guitar amplifier? anything would be appreciated.